Cheese and beer marry deliciously in this indulgent holiday dish. Wisconsin, where I’m from, has a culinary landscape rich with cheese, beer, and deep-fried foods. You can enjoy all three of these food traditions in one delicious, melty bite with a basket of deep-fried, beer-battered cheese curds. (Cheese curds are the youngest form of cheese, springy and squeaky when fresh.) I recently learned that such a combination of fried, salty cheese, happens to be perfect for Hanukkah! When is Hanukkah 2017? Click here to find out! 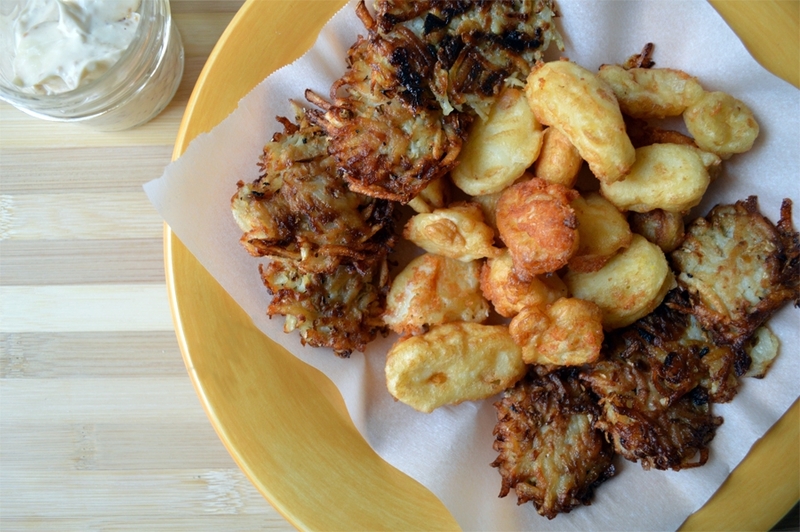 Susan Barocas’ piece in the Washington Post, How Latkes Took Over Your Hanukkah Table–and how to get out of that rut, illuminates how for centuries Hanukkah was associated not with fried potatoes, but with fried cheese. She reminds us that the tradition of frying potato latkes — made possible only by the arrival of potatoes from Central and South America — is barely 200 years old. For centuries before, Hanukkah was celebrated with fried cheese latkes, in celebration of Judith, who, armed with fierce courage and salty cheese, wooed the enemy general to death. Cheese curds and beer batter. 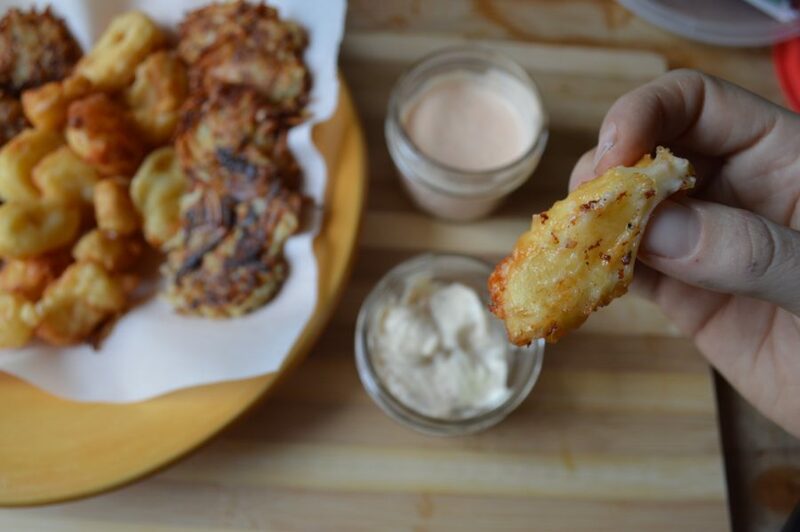 With that, fried cheese curds might just be the perfect way to salute Judith’s role in the Hanukkah story. What’s more, they pair perfectly with bite-sized latkes! While it’s traditional to serve fried cheese curds with ranch dressing, I think that aioli, spiked with mustard or roasted red pepper, is even better. However you enjoy them, these bite-sized appetizers are a mouthwatering way of weaving together the stories of Judith, Wisconsin dairy, and the festival of lights. If you’re making the red pepper aioli, first heat your oven to 425 to roast the red pepper and garlic clove. It’s best to roast a whole pan of both peppers and garlic cloves, or any other vegetable you’d like to roast. Drizzle veggies with olive oil, sprinkle with salt, and roast for 25 minutes. Set aside to cool. Make the aiolis ahead of time (they store well in the fridge) so that you can enjoy the curds and latkes while they’re hot! To make the mustard aioli, simply use a fork to whisk the mayo, mustard and salt together. To make the roasted red pepper aioli, remove the seeds and top from one of the roasted red peppers, and put the pepper into a food processor, along with the mayo, salt (and sriracha, if using). Process until smooth. Set these aside in small dishes. Next, prepare the latkes. Place grated potatoes and onion in a fine mesh strainer or clean tea towel and press/squeeze out as much liquid as possible. Transfer grated potatoes and onion to a large bowl and add the whisked egg, breadcrumbs or flour, salt and pepper. Mix until thoroughly combined. Heat 1 inch of oil in a large, rimmed pan. When the oil shimmers (1 minute of heating or so), drop 5 small spoonfuls of the potato mixture onto the pan. Aim for walnut-sized scoops. Gently flatten each scoop with a metal spatula. Fry 3 to 4 minutes on each side, until golden and crisp around the edges. Set aside to cool on a paper towel-lined plate. Repeat procedure until finished with the potato mixture. Next, prepare the batter in a bowl for the cheese curds. Whisk together seltzer or beer, baking powder, flour, egg and salt until smooth. Heat a Dutch oven or deep, high-rimmed cast iron with 2 inches of oil. Heat until the oil reaches 375 degrees (if you don’t have thermometer, just dip a wooden spoon or chopstick into the oil, and if it causes the oil to bubble steadily, it’s hot enough. If the oil bubbles vigorously, it’s too hot, so turn down the heat). Meanwhile, line a plate with paper towel and set next to your frying station. 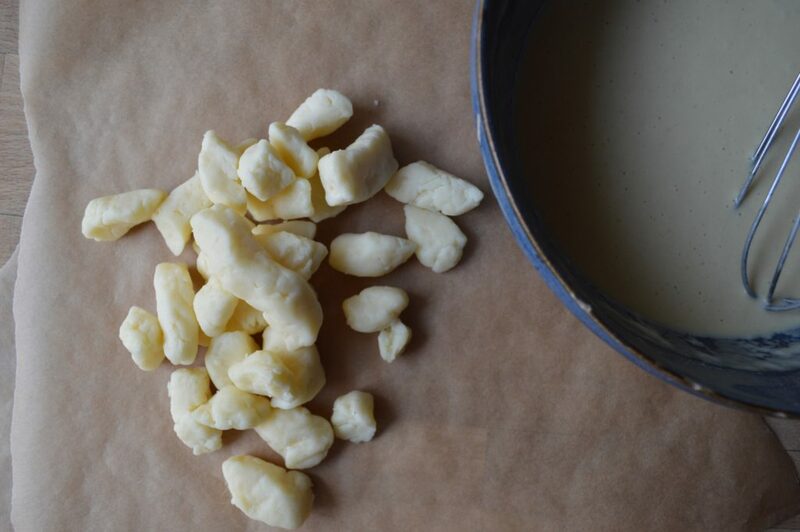 Pour cheese curds into the batter to coat. Use a spoon to drop the cheese curds into the oil. Let fry on one side for 30 seconds and then use a different spoon to turn the curds over so the other side fries. Both sides should look crisp and lightly golden. Quickly remove the curds from the oil and set aside on the paper towel. Repeat this procedure until all cheese curds are fried. Next, line a large plate or basket with parchment paper, and fill with mini latkes and cheese curds. Serve with the aiolis on the side for dipping. Best served when the cheese curds are warm and melty! 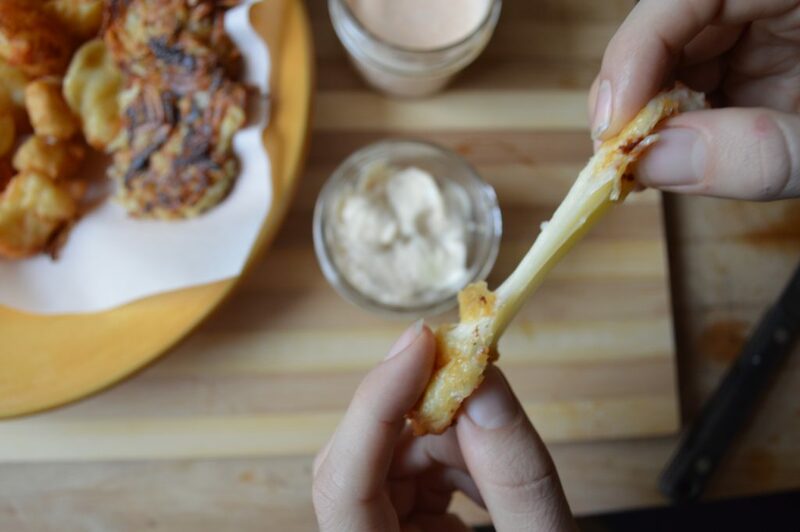 A crispy latke fried in oil then sandwiched together with cheese.